Moscow, 1936 and Stalin’s Great Terror is beginning. In a deconsecrated Church, a young woman is found dead, her mutilated body displayed on the altar for all to see. Captain Alexei Korolev of the Criminal Investigation Division of the Moscow Militia, is asked to investigate. But when he discovers that the victim is an American citizen, the NKVD – the most feared organisation in Russia – becomes involved. As more bodies are discovered and the pressure from above builds, Korolev begins to question who he can trust; and who, in this Russia where fear, uncertainty and hunger prevails, are the real criminals. Soon, Korolev will find not only his moral and political ideals threatened, but also his life . . .
Shortlisted for The Theakstons Crime Novel of the Year, The CWA’s New Blood Dagger. The Kerry Group Irish Fiction Award and The Barry Award for Best First Novel (US). Ryan writes with narrative drive and urgency, a good sense of place and a central character who is conflicted, moral and above all likeable: whodunnit heaven. Ryan can really write — an elegant, evocative English that savours each scene while propelling the action unerringly onwards … there’s much to admire and absorb in this excellent and exciting first novel. Impressive…. Ryan, who merits comparison to Tom Rob Smith, makes palpable the perpetual state of fear of being reported as disloyal, besides dramatizing the difficulty of being an honest cop in a repressive police state. Readers will hope Korolev has a long career ahead of him. A feisty detective novel, it’s atmospheric, beautifully written and meticulously researched. 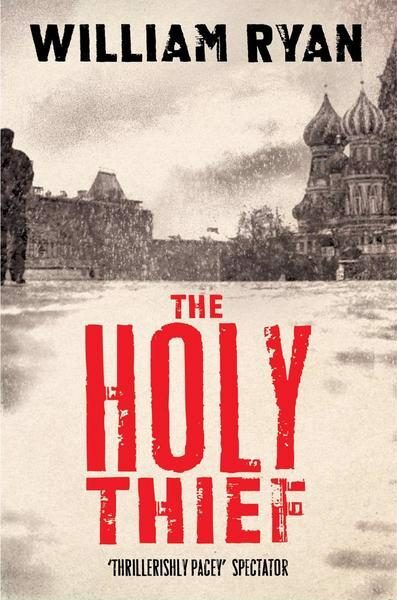 The mystery at the heart of The Holy Thief is intriguing … but it is Ryan’s details of life in the bad old USSR that make the story so engrossing. It’s a tough, suspenseful premise for a debut, contrasting claustrophobic atmosphere with personal optimism in a way that can only intensify as the series continues. Ryan’s novel has an authority that belies his first-novel status… Ryan demonstrates considerable skill in evoking this benighted period, along with a deftness at ringing the changes on familiar crime plotting moves.The auguries for a series, of which The Holy Thief is the first book, are very promising indeed. Excellently-observed characters who exist in a nightmarish world of fear, suspicion and danger. Ryan skillfully captures the reality of life in the most spied-upon society in history…The Holy Thief is an impressive debut from Ryan. It pulls off the difficult task of laying down ample foundations for a scheduled subsequent series without burdening its narrative drive with excessive back-story detail. I look forward to Captain Korolev’s further exploits under the cold gaze of Comrade Stalin. Ryan’s research, and the genuine feel he has for the unique place and time, made The Holy Thief an especially good read. While THE HOLY THIEF is a dark book, Ryan peppers the narrative with some grim humor to keep things from becoming too stark. The star of the novel, however, is the plot, which provides a plausible, surefooted explanation for the motive behind the murders. And while Korolev is a capable protagonist, there is an unforgettable supporting cast as well, one member of whom provides an unexpectedly upbeat conclusion with the promise of more, hopefully to be seen in future successors to this work. Ryan captures the pervasive fear of Stalin’s reign, where even a joke amongst friends can lead to denunciation and exile to the ‘Zone … An impressive debut.